Reference number for this case: 24-Oct-54-Bollwiller. Thank you for including this reference number in any correspondence with me regarding this case. On October 23, 1954, the newspaper Les Dernières Nouvelles du Haut-Rhin published an article headlined "Flying Disc above Bollwiller", telling that the night before, thus on October 22, 1954, around 10:30 p.m., a train engineer, at the train station of Bollwiller, had noticed a very bright disc going towards the forest of the Hardt and disappearing "after some time." The newspaper added that other people in the Bollwiller station had also seen "the curious appearance." The next day, October 24, 1954, the newspaper "L'Alsace" stated that employees of the national railroad company, on duty at the Bollwiller station, had claimed to have seen on October 22, 1954 in the evening "a luminous craft; which moved at a few hundred meters above them." Bollwiller. -- Last night around 10:30 p.m., a locomotive driver noticed from the railway station of Bollwiller, a very bright disc that going towards the Hardt and disappeared after a while. The curious appearance was also seen by other people in the railway station of Bollwiller. 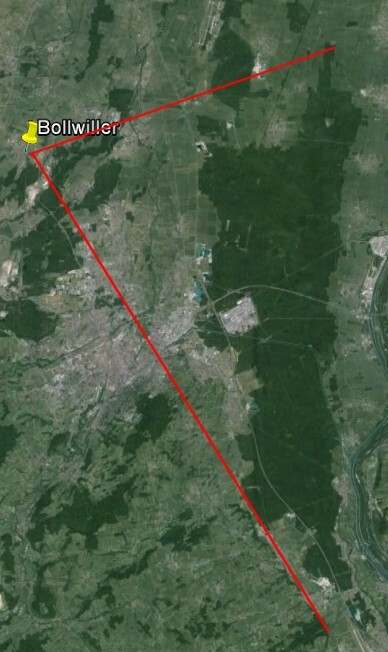 Christian Valentin notes that on Friday October 22, 1954 in the evening later than 06:30 p.m. at the station of Bollwiller, a train driver and some other people see a luminous disc moving towards the forest of the Hardt. Luc Chastan indicates that in the Haut Rhin in Bollwiller on October 24, 1954, "the employees of the S.N.C.F., on duty at the station of Bollwiller, claim to have seen in the evening a luminous machine which moved at a few hundreds of meters above them." Bollwiller. Last night around 10:30 p.m., a locomotive driver noticed from the railway station of Bollwiller, a very bright disc that going towards the Hardt and disappeared after a while. He notes his slight doubt about the late hour because it would have been be just before the publication of the newspaper, but thinks it is not impossible as this happened with other cases, and the newspaper L'Alsace for October 24, 1954, confirms the observation. With the lack of quantitative data - "some time" for example is not a useful data - and an assessment of height of "a few hundred meters" that has no reliability for something unknown seen against the background of the sky, I do not see why the thing would not have been a meteor, for example, as the cigar shape and brightness suggest. Christian Valentin [cv2] expresses doubts on the hour. I wonder if the sighting could be the same object than in Guebwiller at 06:30 p.m., probably a meteor: indeed a correspondant might have told the newspaper is was at "six heures trente" (6:30 p.m.) and have been misunderstood as "dix heures trente" (10:30 p.m.). The pronunciation is quite close and a misunderstanding in bot impossible of the low quality phone lines of the time. [dh1] Article in the regional newspaper Les Dernières Nouvelles du Haut-Rhin, France, October 23, 1954. [---] Article in the regional newspaper L'Alsace, Mulhouse, October 24, 1954. 0.1 Patrick Gross September 13, 2005 First published. 1.0 Patrick Gross March 2, 2009 Conversion from HTML to XHTML Strict. First formal version. Addition [lc1]. 1.2 Patrick Gross October 24, 2014 Additions [dh1], [cv2]. Change of date: October 22, not October 24. Explanation changed from "Not looked for yet" to "Possible meteor or plane." Summary. Notes. 3.1 Patrick Gross May 11, 2015 Addition [sp1]. This page was last updated on May 11, 2015.